The ongoing paradigm since 1746 has been that Tschoop suffered some form of trauma that disabled him due to one of more injuries sustained through drunkenness. This is the story that Tschoop admits to once he has had several encounters with Christian Rauch. This is also the most published description of the events that led to Tschoop’s medical condition, and is perhaps the only story that most past and contemporary historians believe in. Credibility for this story is severely lacking. This is due not only to the significant amount of melodramatics contained in Rauch’s story during its earliest publications, my conclusion is also based on the descriptions of Tschoop’s gait and stance. There is evidence here that suggests something other than drunkenness was more than likely the cause for the type of medical problem Tschoop suffered. As I hope to effectively demonstrate, there are several possible reasons for Tschoop’s appearance and debility (or disability) in the painting and accompanying black and white close-up of Tschoop above. The most likely reason for Tschoop’s success as one of the most important Mahican leaders in local history appears to be either that he suffered from rheumatic arthritis as one of many the side effects of a childhood rheumatic fever that he experienced, or that he developed degenerative lumbar spinal stenosis as a consequence of aging. I will first go through several theories about these two ailments along with several others Tschoop could have had. In the following chapters I will demonstrate how we should interpret these new findings and conclusions. To historians this is just another story to be told about the Moravian Indians, to religiophiles this is more than just a study of disease and self-determination, it has all the predictable variables in human behavior and fate linked to beatification and sainthood. There is no doubt in my mind that this is quite an unexpected and incredible finding resulting from my years of work on Moravian Christian Indian history, one that deserves the most appropriate, most respectful attention. We expect some stories important to history to become more dramatic as the years pass, as the retelling of these stories continue. But this is even more the case for missionary writings. For example the Jesuit writings of their encounters in New France are rich in details due to the significance of these little additions to the anticipated readership. These writings often include sensationalized descriptions of the missionary experience, with lengthy stories, idealistic physical statures, and amazing quotes about Indian language, many of these details that we know can only be of Christian origin. In terms of cultural context and grammer, many of the quotes include pre-staged. overly eloquent lines of passage, a phraseology expected for Christian writings. In the case of Tschoop’s stories and speeches, such words could not possibly be accurate recounts of his own words, especially during the very first encounter he had with Rauch. These words that were passed between Rauch and Tschoop were after all shared in Dutch, not Mahican language. As these Indian versions of Dutch linguistics were translated by Rauch, he may have not have always been aware of their true meaning. Therefore, the descriptions we learn about these words, as Rauch heard and translated them, must be interpreted as sentences typical to a story with a well-defined, well-crafted goal targeting any later pro-missionaries readership. These words were not meant for anyone to read this for the first time for purely historical purpose. On the other hand, setting this biasness against Christian style of writing aside, if we accept the facts of Tschoop’s statements regarding his condition, then we can assume that he had in fact suffered some sort of injury which in turn led to his disabling state. The exact cause of this injury, because it happened before Rauch met the Mahicans for the first time, may have been, as Rauch so openly claimed, a consequence of some rum and whiskey provided to the Mahicans due to some recent bartering. It might have also been a result of a poorly calculated move across the natural landscape that Tschoop made, causing him to fall or tumble down a hillside or ravine, experiencing an injury very much capable of causing the severe sprain, strain, tear, dislocation and/or fracture of the legs and torso required to prevent Tschoop from holding an erect posture while standing. Even more importantly, were this the case, such an event may not at all be due to a state of drunkedness as suggested by Rauch. The gaits and postures forced upon Tschoop that Rauch interpreted to be those of a drunkard, were in fact the consequences of a fairly normal injury or illness that Tschoop and many other people, Indian or not, are forced to live with. More important to note are the differences between Rauch’s philosophical interpretation of Tschoop’s condition. There was a philosophical interpretation that Rauch assigned to this condition, claimed to be the belief held by Tschoop and his people. This interpretation Tschoop tells us about himself, but the exact source of the words Tschoop used to describe, and more importantly, define the cause for his medical condition, may not have been anything like Rauch’s perception of this condition leads his readers to suspect. We do not know the exact words Tschoop might have first used to describe his medical state to Rauch, even if he could describe this to Rauch. Missionary Rauch would have been completely incapable of understanding the philosophy and theory behind Tschoop’s illness, told to him from a Native American perspective. Tschoop’s change in gait, his inability to stand up straight for too long, his tendency to look huskier and heavier than the others, may have been perceived by Tschoop to be a consequence of the old fashioned Native American culturally bound syndrome–invasion of animal spirit. His looks and appearance, much like that of a grizzly bear to natives and other wilderness-savvy individuals, may have been so much like a beast that through cultural expectations alone, Tschoop may not have ever been able to describe the reason for his state to a missionary agent, nor would he have been able to define much more than a metaphysical cause for such a medical state. The weight, the tendency to fall or remain close to the ground, the heavy forearms and legs, all might have been something akin to what happens when one is bitten by a venomous snake like a rattler. In a number of colonial writings pertaining to snake bites (often in association with the matching miracle treatment–the local “snakeroot” herb), we find descriptions telling us how the skin becomes mottled, the body becomes weak and unstable, the body convulsing and crawling about the surface of the ground much like the snake that bites. These symptoms are very much interpretable as something suggesting the old Native American philosophy of being possessed by the manitoo, some past shaman, or some animal spirit. Were it the snake, you needed the closest snakeroot to amend your unfortunate state. For Tschoop, was this condition due to the bear? Was it treatable? There is not much direct evidence indicating that this adherence to some spiritual cause for the ailment in accordance with Native American philosophy was actually the case for Tschoop. His gradually worsening medical state may have been slow enough to not cause such a major concern by the shamans. Like Shabash (baptism name Abraham), Tschoop was a highly respected elder and/or leader of the group. For this reason, he never had to deal with the problems others might encounter when such a condition comes on so aggressively and infirmatively. Tschoop was the leader of his people. Nothing about his medical state needed any further explanation in the minds of his most avid followers. Whereas John’s (Tschoop’s) demise was ultimately due to smallpox in 1746, the main reason for his illness and life of medical suffering was something completely different from what Rauch and his followers in Moravian-Mahican history have been telling us. There is significant evidence supporting the notion that there was a period of suffering in Tschoop’s life, based on his appearance in the paintings, evidence not so much found in Tschoop’s published words. More than likely it was this suffering that caused Tschoop to grab the attention of Moravian Missionaries like Christian Henry Rauch. In the long run, it may have even been the key factor in Tschoop’s decision to convert to Christianity in the upcoming years. We still do not know however exactly what Tschoop’s medical condition was. Was it a condition he had throughout his life, one that he may have been born with or suffered as a child? Was it something that happened to him due to his recklessness in recent years? Was it a condition he acquired due to some sort of epidemiological fate that he and other American Indians had to endure during this period inAmerican history, such as exposure to the measles? Or was it simply the result of a common infectious disease already common to this area, one that was neither unique or unusual, but one which can come and go, and on occasion have devastating effects due to long term biological consequences? The missionary writings and early historians who wrote about this part of New York history tried to convey to their readers the possibility that John’s physical state was a medical problem that he sustained due to his lack of control. They often remark about it as if it were a consequence of drunkenness, consequences he brought onto himself due to his need for salvation. This could very well be the case, for we see throughout the local history of Iroquois encounters with European landowners, traders and businessmen often successfully bartering with the Native Americans by including alcoholic beverages as a major part of their offerings. This trading behavior was on and off very common in the New York Hudson Valley setting, but not much of this trade took place with Mahicans. However, more of this appears to have taken place with the Iroquois, as a consequence of 18th century trade more than 17th century trade. Five theories are reviewed here for the mysterious illness John experienced. The first is that he did have an injury that he sustained leading to the state and condition he was in when he met with Rauch for the first time. The second is that he had a childhood disease which members of his immediate family also suffered due to earlier interactions with the first settlers and traders to explore this part of North America, with emphasis on one condition in particular that might have been led to his disabled state as Tschoop got older. The third is an extension of this same theory, focusing on the possibility that Tschoop went through this experience during his adult years rather than childhood years. 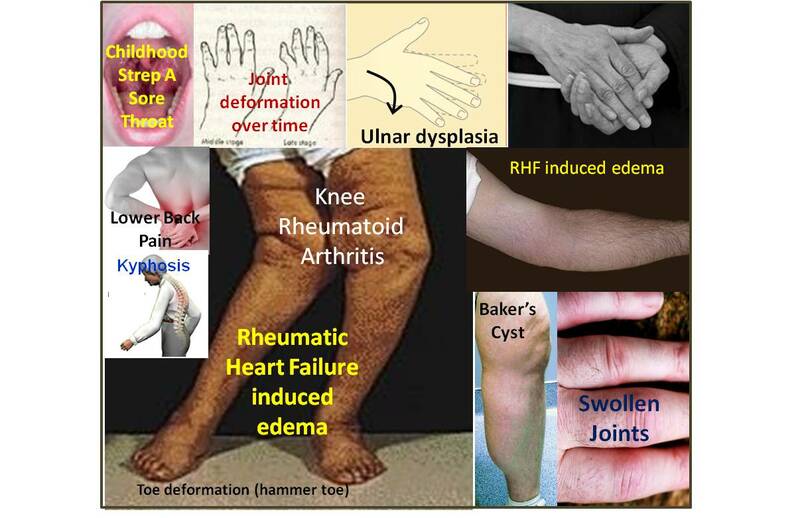 The fourth is a review of the possibility that this illness was something already common within the local environment of the tribal encampment and later the missionary village setting, in particular childhood rheumatic fever followed by the much later development of rheumatoid arthritis. 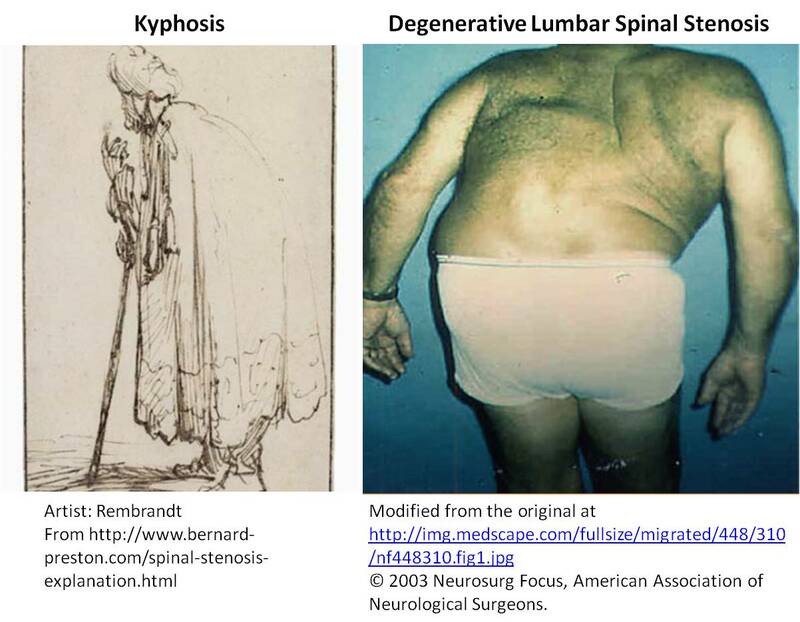 The fifth theory is that his medical condition was due to simple aging, either in the form of simple kyphosis or the more complex degenerative lumbar spinal stenosis. I should also note here in passing that certain congenital conditions that may have resulted in similar appearing conditions were considered. These were immediately excluded based on the writings of other missionary groups. It was not unusual for newborns with fetal malformation and congenital dysplasias or abnormal effect and response to be abandoned by tribal leaders, and were often considered some sort of message from the Creator. This was in fact one of the major reasons the missions were so outspoken about the “barbaric” traditions that such “heathens” practiced throughout the 17th century in New France. The 17th century attitudes Christians had towards the American Indians for a short while saved them from the weapons of European immigrants, namely the spread of highly contagious infectious diseases. As this fear for interaction other than at some political or government level enabled to two to remain pretty much isolated at a personal level, except when on occasion an encounter resulted leading to the death of European settlers. It was often the spread of contagion to a tribal setting that in fact led to some of these “revenge” killings of European occupants. Often it was the case that whenever an epidemic struck a tribal community, they in turn struck back from this attack of “bad spirits” from the colonist’s own versions of the shaman or medicine man–their government leaders. As early as the mid 1600s, there is evidence that the Dutch favored the Iroquois over the Mahican and other small groups when it came to establishing a trade relationship. For this reason the Iroquois were even able to set up as part of the local farmer’s market that the Dutch made use of regularly in the heart of New Amsterdam. We also find that they had some trade relationships also existed between the American Indians and New France or Canada, economic activities capable of sustaining these relations in the future and diminishing the profits earned by other groups in New Netherlands/New York. Following a decrease in trade relationships with the smaller local Native groups, the most important trade relationship came to be with the Iroquois. Some of the hopes at this time were that by successfully commencing new trade relationships with the Iroquois, that the unnecessary battles taking place at the English-French-Indian borders would soon diminish. Rarely did such a trade relationship become a sustained outcome. The home missions may have set the stage for some of the events that ensued during the late 1600s and early 170os. A number of religious leaders supported the theory posed that American Indians were descendents of the Jews, the thirteenth tribe often referred to in some of the more ancient writings. We know this was a popular theory for the reason the American Indians existed, and were not found mentioned in the Old or New Testament. Scholars were arguing that in fact these missing people did exist, long-lost and forgotten due to their migration to the New World. This theory for why the American Indians could exist was most popular amongst New France writers, especially those of the mid to late seventh century, Missionaries often acquainted with the tribes of the Great Lakes region along with the eastern borders of Arcadia and Canada (see Jesuit Brother Francis Hegeman’s writings for example, on the consequences of DeSoto’s missions). So, the home missionary movement does provide with the means by which a leader like John could have suffered the first type of disease theorized to be related to his physical condition–measles (not small pox). Other evidence suggesting that there was possibility a history of recurring epidemic disease patterns precluding John’s medical condition relate to an interesting domestic relationship ongoing during this period of time. One of the major forms of communication that took place between non-Iroquois Indians and settlers in the Hudson Valley, and related to the home-based missionary movement and the Dutch families engaged in the process, pertains to the Dutch practice of communicating with and in some cases “acquiring” or otherwise obtaining American Indians, of Middle and South American as well, for use as “servants”. 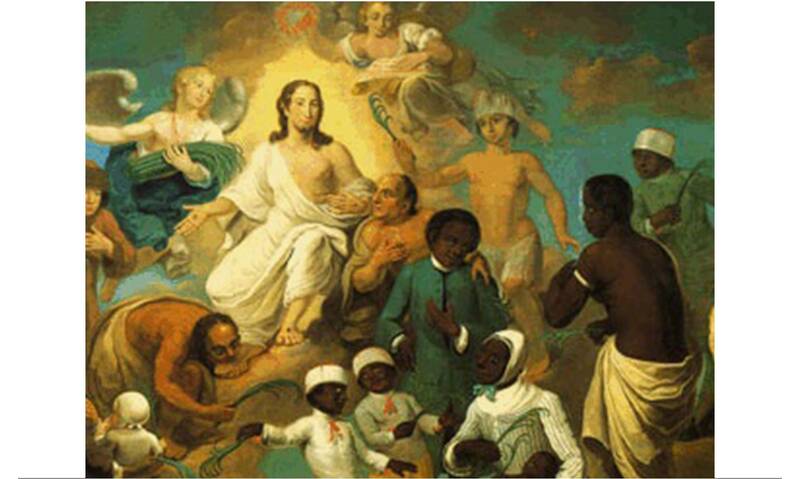 Accompanying this need for their services was the desire to convert them to Christianity, which in turn could be followed by manumission for those who became legal servants, a symbol of the true Christianization of these individuals. Catherine Filipse, for example, one of the earliest settlers and a member of the primary family to own what is now Westchester County, is an example of how this was practiced (see related writings elsewhere under “Missionalia”). Another missionary movement common to the Hudson Valley early in its history involved the early in-migration of Moravians, Dutch and others during the late 1600s and early 1700s, resulting in families consisting of Native American wives and European husbands. These marriages were established as part of an attempt to improve economic relationships between the Dutch and the Indians, as evidenced by the writings provided by Jasper Danckaerts who witnessed these new families’ activities during the 1670s as he passed through this region. These habits of intermarrying with Iroquois were not as frequently attempted as they were with much smaller Native American groups in lower New York region. For this reason, we do not see very many examples of activities taking place north of Shekomeko. Those groups of natives, who were once common to the lands north of Shekomeko, had already established stable relationships at the economic level, or removed elsewhere to places further west by the time the Moravian Missions were established in 1740. This suggests that Moravian missions like the one at Shekomeko represented a final effort to move the American Indians elsewhere, in order to open up any remaining settlement space for future use by colonists. The removal of many of the Indians who were potentially violent in nature in the Hudson Valley and eastward into Connecticut greatly reduced the chances that some sort of skirmish may have led to John’s medical state. Of course this was not an impossible event, but it was very unlikely. For one thing, the possibility of an injury due to battle or some other form of civil disagreement amongst Natives seems unlikely for John, for had he and his people engaged in such an activity in recent years, just before Christian Rauch met up with them for the first time,the relationship that these Mahicans developed with the Missionaries during the weeks ahead would not have taken place. John would have also lost significant members of his small group, in particular the male spouses. In addition, John and his people may not have been as trustworthy and willing as they were to Rauch and his Missions. This suggests that due to the social history of the Mahicans and the local settlers moving in, no war related activities led to John’s growing medical problem. The likelihood that this medical condition is a result of an accident can also be ruled out due to the relatively early death of John soon after his conversion to Christianity. John could have been too old to continue to survive in some sense, but his vitality and mental ability were not at all changed. His major problem, a semi-crippling and perhaps painful medical condition that should have resolved were it simple inflammatory in origin due to injury. Such an injury would not have caused his demise. One other possibility for the edema-like nature of Tschoop’s legs is what is known in the contemporary medical literature as morbid obesity. This is when an individual is significantly overweight, usually due to changes in life style patterns in relation to food consumption patterns. The reason this is possible pertains to a well documented metabolic problem Native Americans have due to an inherited condition current referred to as “metabolic syndrome.” This exists when the body’s metabolic rate is less than its food consumption rate calorie-wise. In the 1980s, this condition was first identified as a Native American syndrome and named “New World Syndrome”. The medical anthropologists detailing this condition referred to it as a survival trait, improving the likelihood of survival during unanticipated periods of famine. In the more modern westernized setting, they claimed this condition developed due to diet and activity changes, brought on by settlement in urban settings and communities that demonstrate a considerable about of “modernization” and increase in sedentary life style patterns (i.e. kids sitting at home watching television instead of recreating outside.) As a medical problem, this syndrome has associated with it obesity, diabetes onset, and an increase in related problems such as hypertension, hyperlipidemia (high “cholesterol”), heart attack, gall bladder disease, and pancreatitis onset. Essentially this is due to the body’s tendency to store excess calories consumed in the form of adipose tissue, in preparation for the regular periods of starvation and limited food stores that are experienced. The appearances of Tschoop’s shoulder and upper arm profile suggest this condition. The factors against this condition include the degree of disability that was brought on by this change in body mass, shape and weight, and the amount to which this condition limited Tschoop’s ability to travel. Severely morbid obesity would have this effect on someone, but due to the living conditions the Mahicans experienced before they were converted and developed a more “calories enriched” village setting bearing domestic meats, eggs, grains and other farmed crops, this seems unlikely. This would suggest that he Mahicans were very well off food and calorie wise, in which case we might expect other natives to be developing this condition as well. In addition, a substantial amount of complex carbohydrate food substances would have to be part of their diet, a dietary possible if their main product was corn or wild rice, or some large root bearing plant like Smilax or Ipomoea. But no evidence exists suggesting either of these forming sizeable staples in their diet. Their constant hunting and fishing routine offered them the exercise activities required to prevent this metabolic state from developing. Even the recurring travels to the other missions would have served to prevent this condition from impacting other Mahicans, and reduce this problem over time for Tschoop. 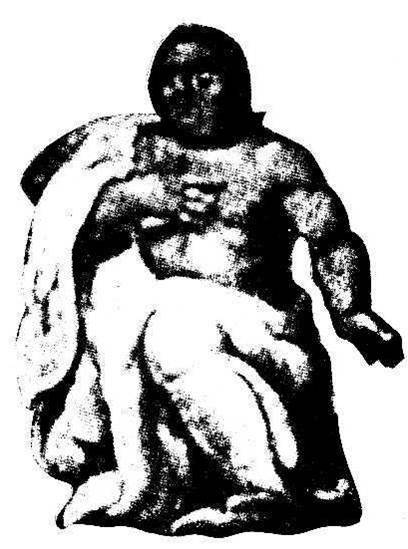 This suggests that the morbid obesity look Tschoop has may in fact be due to increases in water weight brought on as some form of heart failure related edema, displaying itself significantly in the lower legs, with excerbations displayed as well in the uppe body suggesting this condition to be of a fairly chronic nature. Therefore, due to these simple behaviors alone, the possibility of injury is pretty much ruled out as an option. This also suggests that some of the writings about John fall from a state of good health to one of debauchery, was more a product of the writer, not of his decision to imbibe uncontrollably in alcoholic beverages. Were John that out of control due to imbibing, we might also expect Rauch to in fact be more hesitant about even approaching, and perhaps reporting on this forward approach to him as an event that was tried, but not for long for fear or retaliation. Another possibility is that due to increasing interactions with the European settlers, some sort of highly contagious infectious disease most recently took place that led to John’s disabled state. John, as well as other Mahicans, could have been exposed to infectious diseases, either directly or indirectly from the settlers. This version of the infectious disease theory for John’s state assumes that John caught measles as an active adult engaging in trade missions and other encounters with European agents, entrepreneurs and settlers. Measles is a very possible option for John’s medical condition during his later years. Had he caught the measles, especially at an older any age, his ability to survive this event put him in a special group of Native Americans. The fatality rates of this disease even to Europeans was fairly high, but not as high as small pox. Unlike Small Pox, measles was not frequently fatal. As a result of surviving this infectious disease, one can be left with any of a number of medical conditions that ultimately give rise to the signs and symptoms that John expressed. Some of these symptoms such as arthritis are very similar to inferred by the appearance of John in the painting with him seated alongside Jesus and totally exposed to the viewer. However, there is also the possibility that the measles will leave its patients with some dermatological evidence for the history of this problem, a modification of the skin not so easily detectable in the paintings. The arthritis that develops due to measles occurs in about 5% of the cases, so it is very much possible that John had such a condition as an adult, or as noted previously, when he was much younger. This would also imply that somehow his close relatives whom he lived with also caught this disease, if he caught it as a child, which in turn implies that earlier interactions between Mahicans and Colonists were taking place as well, a very common activity during the very late 1600s and very early 1700s. This means that it is very much possible for John to have suffered and survived a measles infection, which could make him worthy of his chieftain status, but in the least make turn him into an important spiritual leader and medicine man. The third option for John is that he had a long-term chronic disease onset due to some childhood illness that compromised his immune system over the years. Such are the consequences of rheumatic fever due to Streptococcus Type A sore throat and fever. Had John suffered such a condition during his childhood, other problems he might have suffered included the failure of his heart related to a growing heart valve failure problem, and the long term onset of Rheumatoid Arthritis. Such a medical problem would have made John very weak as the valve suddenly degenerated, and the joints began to deteriorate. This in turn might have made him feel weak, though not necessarily incapable of walking about. The other evidence supporting the possibility that this illness afflicted John is the condition of his hands, in particular of his joints (digital finger is swollen, 3rd and 4th fingers are crossed due to swelling and deformation.) There is a moderate deformation and swelling of other joints that may be present, such as his lower legs from the knee down. These multiple joint deformations suggest an autoimmune generated arthritis had developed, a condition of later onset in people. John’s posture tells us that he is becoming more sedentary due to some sort of stress on his physiology. Such a problem can result from heart valve failure, accompanied by weakness of the back and leg muscles. The moderate bending of the knees John displays is a condition known as rheumatoid genicular arthralgia, an arthritis of the knees typical of rheumatism during one’s later decades in life. Further supporting this condition is the fairly “chubby” look to his upper and lower arms. This could be a consequence of dietary habits, which was a condition atypical of American Indians, during colonial times due to their lifestyle and survivalist dietary habits. This “chubby” appearance may also be due to an increase in body fluids related to heart failure and the related edema that typically ensues. Due to the angle of the legs, we don’t see overt evidence for edema appearing in the lower legs or feet as well, but the inference is there due to his moderately to greatly swollen leg forms. Therefore, this heart failure induced edematous state seems likely, and cannot be ruled out. This means that rheumatism was a very likely cause for John’s medical condition, due to the large number of signs and symptoms involving multiple organ systems that John presents with. John’s condition may have also been the simple result of aging. Aging is not unusual for Native American leaders. A simple look at Mi’kmaq history for example provides us with a story detailing a Mi’kmaq Indian called Membertou, who is described at least twice in the explorer’s writings. The first by an explorer of the Nova Scotia-Newfoundland area in the mid 1500s when he is newly married, and the second by Champlain himself during the early 1600s, in which the description of Membertou depicts him as their oldest member and cheiftain. This longevity has its own unique evolutionary and biological history that I have reviewed as part of my other studies of Native American medical history. Suffice it to say, the traditional methods of lving for Northeastern Indians is very much a test of life and survival instincts. Had Tschoop remained alive as a part of the Mahican Indians he lived with, were it not for his medical condition(s), he too could have lived to become a very old man. Ongoing vertebral fractures can limit the mobility of someone, but it often does not add the types of severe conditions Tschoop was noted to possess, such as the inability to stand erectly at times due to ongoing discomforts and pains, to the extent that the debilitation results in someone lying on the floor as has been discussed about Tschoop. In addition, the degree of deformation noted in Tschoop when he is seated next to Jesus, in particular his lean towards his right side, suggests he had an addition deformity, such as simple scoliosis. This too is ruled out due to the tendency for scoliosis to have been a disability with onset much earlier in his life, meaning Tschoop would have had limited skills during his more productive years decades earlier. Social and ecological factors would have limited his chances for survival to his current age. The second possibility for a condition experienced by Tschoop relate to his age and the aging experience is Degenerative Lumbar Spinal Stenosis. This would have been considerably more debilitating than simple kyphosis, and would have resulted in difficulty with standing, sitting, and maintaining any position with the back straight for long periods of time. This would have also resulted in an inability to travel frequently, such as to Bethlehem. Upon first glance, the deformation could have easily been misinterpreted a the result of injuries induced by leading a “wild life” so to speak. More importantly, this condition most closely resembles Tschoop’s seating posture in the paintings (the picture is a remarkable look-alike in fact of the black-and-white cutout produced by Alpern in 1984). The most like condition Tschoop suffered was either some form of long term, chronic rheumatic condition or degenerative lumbar spinal stenosis. The rheumatic condition would suggest he was about the age of 45 to 65 years of age. The degenerative lumbar spinal stenosis would suggest he was older, by at least 10 years. Simple kyphosis is ruled out due to lack of specific conditions Tschoop had such as the ongoing lower back pain and lower spinal deformation-induced postural limitation. Likewise, this feature also rules out the simple arthritis events expected to occur due to a history of measles. Most importantly, simple injury-induced disability suggested in most of the history writings on the Moravian missions, is ruled out. 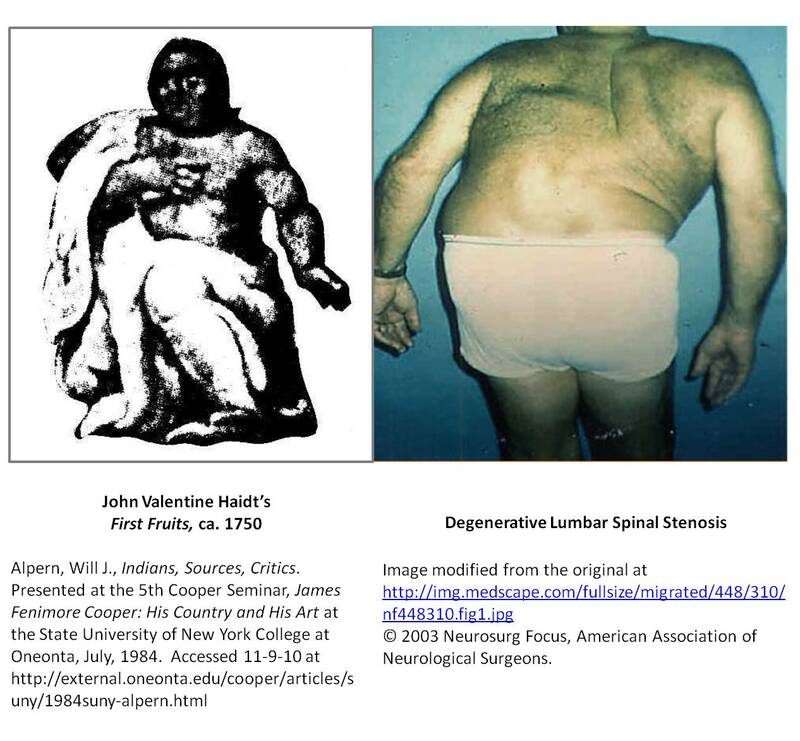 Tschoop’s “chubby” appearance may be due to weight gain induced by reduced physical activity and the onset of metabolic syndrome so typical to Native Americans, or is actually an edematous condition indicative of heart failure relate to a rheumatic fever event suffered during childhood.